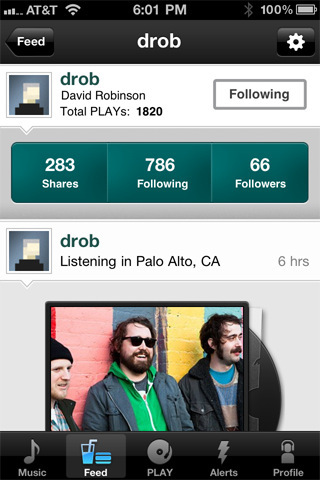 PLAY is a new iPhone app from AOL Music that lets you listen to some free music as well as share your music taste using your new PLAY profile. Without setting up a profile the app let’s you browse and listen some random music under what it calls “CD Listening Party” with full length albums from some obscure bands. There is also a section called MP3 of the Day where single tracks from random artists are featured on a daily basis. Again here you’ll be looking at indie bands good if you’re into discovering new music. The PLAY app also pulls in your iPod music makes it playable within itself, which is nice since you’re able to share stuff you’re listening to via Facebook or Twitter. If you remember the SHOUTcast Radio, you’ll be happy to find the entire stream of live radio station also stuffed into the PLAY app. Once you start to follow and be followed on PLAY, your profile gets updates from your friends and can be a good way to discover what your social circle is engaging in musically. Overall, the PLAY app from AOL is a nice way to get your existing music library a social presence, and create a new circle of friends with similar musical tastes. You can also listen to some up and coming artists and sample a few tunes that you might possible like. The app is free and worth checking out. You can’t really find artists or play any music on demand, but it does give you yet another social profile to pimp out. AppSafari review of PLAY by AOL Music was written by Joe Seifi on July 15th, 2011 and categorized under App Store, Music, Social. Page viewed 3780 times, 1 so far today. Need help on using these apps? Please read the Help Page.